Solidarity (Polish: Solidarność, pronounced [sɔlʲiˈdarnɔɕt͡ɕ] ( listen); full name: Independent Self-governing Labour Union "Solidarity"—Niezależny Samorządny Związek Zawodowy "Solidarność" [ɲezaˈlɛʐnɨ samɔˈʐɔndnɨ ˈzvʲɔ̃zɛk zavɔˈdɔvɨ sɔlʲiˈdarnɔɕt͡ɕ]) is a Polish labour union that was founded on 17 September 1980 at the Lenin Shipyard in Gdańsk under the leadership of Lech Wałęsa. It was the first trade union in a Warsaw Pact country that was not controlled by a communist party. Its membership peaked at 10 million members at its September 1981 Congress, which constituted one third of the total working-age population of Poland. In the 1980s, Solidarity was a broad anti-bureaucratic social movement, using the methods of civil resistance to advance the causes of workers' rights and social change. The government attempted to destroy the union by imposing martial law in Poland, which lasted from December 1981 to July 1983 and was followed by several years of political repression from 8 October 1982, but in the end it was forced to negotiate with Solidarity. In the union's clandestine years, Pope John Paul II and the United States provided significant financial support, estimated to be as much as 50 million US dollars. The round table talks between the government and the Solidarity-led opposition led to semi-free elections in 1989. By the end of August, a Solidarity-led coalition government was formed. In December 1990, Wałęsa was elected President of Poland. Since then, Solidarity has become a more traditional liberal trade union. Its membership had dropped to 680,000 by 2010 and 400,000 by 2011. In the 1970s Poland's government raised food prices while wages stagnated. This and other stresses led to protests in 1976 and a subsequent government crackdown on dissent. The KOR, the ROPCIO and other groups began to form underground networks to monitor and oppose the government's behavior. Labour unions formed an important part of this network. In 1979, the Polish economy shrank for the first time since World War II, by 2 percent. Foreign debt reached around $18 billion by 1980. Anna Walentynowicz was fired from the Gdańsk Shipyard on 7 August 1980, five months before she was due to retire, for participation in the illegal trade union. This management decision enraged the workers of the shipyard, who staged a strike action on 14 August defending Anna Walentynowicz and demanding her return. She and Alina Pienkowska transformed a strike over bread and butter issues into a solidarity strike in sympathy with strikes on other establishments. Solidarity emerged on 31 August 1980 at the Gdańsk Shipyard when the communist government of Poland signed the agreement allowing for its existence. On 17 September 1980, over twenty Inter-factory Founding Committees of free trade unions merged at the congress into one national organization NSZZ Solidarity. It officially registered on 10 November 1980. Lech Wałęsa and others formed a broad anti-Soviet social movement ranging from people associated with the Catholic Church to members of the anti-Soviet left. Solidarity advocated non-violence in its members' activities. [self-published source] In September 1981 Solidarity's first national congress elected Wałęsa as a president and adopted a republican program, the "Self-governing Republic". The government attempted to destroy the union with the martial law of 1981 and several years of repression, but in the end it had to start negotiating with the union. Roundtable Talks between the government and Solidarity-led opposition led to semi-free elections in 1989. By the end of August a Solidarity-led coalition government was formed, and in December Tadeusz Mazowiecki was elected Prime Minister. Since 1989 Solidarity has become a more traditional trade union, and had relatively little impact on the political scene of Poland in the early 1990s. A political arm founded in 1996 as Solidarity Electoral Action (AWS) won the parliamentary election in 1997, but lost the following 2001 election. Currently, as a political party Solidarity has little influence on modern Polish politics. Unlike the Carter Administration, the Reagan policies supported the Solidarity movement in Poland, and—based on CIA intelligence—waged a public relations campaign to deter what the Carter administration felt was "an imminent move by large Soviet military forces into Poland." Michael Reisman from Yale Law School named operations in Poland as one of the covert actions of CIA during Cold War. Colonel Ryszard Kukliński, a senior officer on the Polish General Staff was secretly sending reports to CIA officer David Forden. The CIA transferred around $2 million yearly in cash to Solidarity, for a total of $10 million over five years. There were no direct links between the CIA and Solidarnosc, and all money was channeled through third parties. CIA officers were barred from meeting Solidarity leaders, and the CIA's contacts with Solidarnosc activists were weaker than those of the AFL-CIO, which raised $300,000 from its members, which were used to provide material and cash directly to Solidarity, with no control of Solidarity's use of it. The U.S. Congress authorized the National Endowment for Democracy to promote democracy, and the NED allocated $10 million to Solidarity. When the Polish government launched martial law in December 1981, however, Solidarity was not alerted. Potential explanations for this vary; some believe that the CIA was caught off guard, while others suggest that American policy-makers viewed an internal crackdown as preferable to an "inevitable Soviet intervention." CIA support for Solidarity included money, equipment and training, which was coordinated by Special Operations. Henry Hyde, U.S. House intelligence committee member, stated that the USA provided "supplies and technical assistance in terms of clandestine newspapers, broadcasting, propaganda, money, organizational help and advice". Initial funds for covert actions by CIA were $2 million, but soon after authorization were increased and by 1985 CIA successfully infiltrated Poland. In Sollicitudo rei socialis, a major document of Catholic Social Teaching, Pope John Paul II identifies the concept of solidarity with the poor and marginalized as a constitutive element of the Gospel and human participation in the common good. The Roman Catholic Church, under the leadership of Pope John Paul II, was a very powerful supporter of the union and was greatly responsible for its success. Wałęsa, who himself publicly displayed Catholic piety, confirmed the Pope's influence, saying: "The Holy Father, through his meetings, demonstrated how numerous we were. He told us not to be afraid." In addition, the priest Jerzy Popiełuszko, who regularly gave sermons to the striking workers, was eventually killed by the Communist regime for his association with Solidarity. Polish workers themselves were closely associated with the Church, which can be seen in the photographs taken during strikes in the 1980s. On the walls of several factories, portraits of the Virgin Mary or John Paul II were visible. In 2017, Solidarity backed a proposal to instate blue laws that would prohibit Sunday shopping, a move supported by Polish bishops. A 2018 new Polish law banning almost all trade on Sundays has taken effect, with large supermarkets and most other retailers closed for the first time since liberal shopping laws were introduced in the 1990s. The Law and Justice party passed the legislation with the support of Prime Minister Mateusz Morawiecki. Although Leszek Kołakowski's works were officially banned in Poland, and he lived outside the country from the late 1960s, the philosopher's ideas nonetheless exerted an influence on the Solidarity movement. Underground copies of his books and essays shaped the opinions of the Polish intellectual opposition. His 1971 essay Theses on Hope and Hopelessness, which suggested that self-organized social groups could gradually expand the spheres of civil society in a totalitarian state, helped inspire the dissident movements of the 1970s that led to the creation of Solidarity and provided a philosophical underpinning for the movement. Kołakowski later described Solidarity as "perhaps [the] closest to the working class revolution" that Karl Marx had predicted in the mid-1800s. Ironically, however, Solidarity featured many elements contrary to socialism as conceived by Marx: "[workers organized] against the exploiters, that is to say, the state. And this solitary example of a working class revolution (if even this may be counted) was directed against a socialist state, and carried out under the sign of the cross, with the blessing of the Pope." The survival of Solidarity was an unprecedented event not only in Poland, a satellite state of the USSR ruled (in practice) by a one-party Communist regime, but the whole of the Eastern bloc. It meant a break in the hard-line stance of the communist Polish United Workers' Party, which had bloodily ended a 1970 protest with machine gun fire (killing over thirty and injuring over 1,000), and the broader Soviet communist regime in the Eastern Bloc, which had quelled both the 1956 Hungarian Uprising and the 1968 Prague Spring with Soviet-led invasions. Solidarity's influence led to the intensification and spread of anti-communist ideals and movements throughout the countries of the Eastern Bloc, weakening their communist governments. As a result of the Round Table Agreement between the Polish government and the Solidarity-led opposition, elections were held in Poland on 4 June 1989, in which the opposition were allowed to field candidates against the Communist Party—the first free elections in any Soviet bloc country. A new upper chamber (the Senate) was created in the Polish parliament and all of its 100 seats were contestable in the election, as well as one third of the seats in the more important lower chamber (the Sejm). Solidarity won 99 of the 100 Senate seats and all 161 contestable seats in the Sejm—a victory that also triggered a chain reaction across the Soviet Union's satellite states, leading to almost entirely peaceful anti-communist revolutions in Central and Eastern Europe known as the Revolutions of 1989 (Jesień Ludów or Wiosna Obywatelów), which ended in the overthrow of each Moscow-imposed regime, and ultimately to the dissolution of the Soviet Union in the early 1990s. Given the union's support from many western governments, relations with trade unions in capitalist countries could be complicated. For example, during the UK miners' strike of 1984–85, Wałęsa said that "The miners should fight, but with common sense—not with destruction" and said of Margaret Thatcher "With such a wise and brave woman, Britain will find a solution to the strike." However, David Jastrzębski, the president of Upper Silesia Solidarity, voiced his support of the striking miners: "Neither the British government's mounted police charges nor its truncheon blows, any more than the Polish junta's tanks or rifle fire, can break our common will to struggle for a better future for the working class." This was despite the fact that Arthur Scargill, president of the British National Union of Mineworkers had been highly critical of Solidarity, condemning it as an "anti-socialist organization which desires the overthrow of a socialist state". In late 2008, several democratic opposition groups in the Russian Federation formed a Solidarity movement. In the United States, the American Solidarity Party (formerly the Christian Democratic Party USA), a Christian democratic political party, attributes its namesake to Solidarity. In a 2011 essay "The Jacobin Spirit" in the American magazine Jacobin, philosopher Slavoj Zizek called Solidarnosc' one of the "free spaces at a distance from state power" that used "defensive violence" to protect itself from state control. The notion of "defensive violence" runs in the vein of ideas postulated by Alain Badiou. The union was officially founded on 17 September 1980, the union's supreme powers were vested in a legislative body, the Convention of Delegates (Zjazd Delegatów). The executive branch was the National Coordinating Commission (Krajowa Komisja Porozumiewawcza), later renamed the National Commission (Komisja Krajowa). The Union had a regional structure, comprising 38 regions (region) and two districts (okręg). At its highest, the Union had over 10 million members, which became the largest union membership in the world. During the communist era the 38 regional delegates were arrested and jailed when martial law came into effect on 13 December 1981 under General Wojciech Jaruzelski. After a one-year prison term the high-ranking members of the union were offered one way trips to any country accepting them (including Canada, the United States, and nations in the Middle East). Solidarity was organized as an industrial union, or more specifically according to the One Big Union principle, along the lines of the Industrial Workers of the World and the Spanish Confederación Nacional del Trabajo (workers in every trade were organized by region, rather than by craft). In 2010, Solidarity had more than 400,000 members. National Commission of Independent Self-Governing Trade Union is located in Gdańsk and is composed of Delegates from Regional General Congresses. Copper Basin, based in Legnica. Poznań H. Cegielski - Poznań S.A.
^ Aleksander Smolar, '"Self-limiting Revolution": Poland 1970–89', in Adam Roberts and Timothy Garton Ash (eds. ), Civil Resistance and Power Politics: The Experience of Non-violent Action from Gandhi to the Present, Oxford University Press, 2009, ISBN 978-0-19-955201-6, pp. 127–43. ^ Tony Judt (2005). Postwar: A History of Europe Since 1945. The Penguin Press. p. 589. ^ KOR: a history of the Workers’ Defense Committee in Poland, 1976–1981. Berkeley: University of California Press. 1985. ISBN 0-520-05243-9. ^ a b Steger, Manfred B (January 2004). Judging Nonviolence: The Dispute Between Realists and Idealists (ebook). Routledge (UK). p. 114. ISBN 0-415-93397-8. Retrieved 9 July 2006. ^ Paul Wehr; Guy Burgess; Heidi Burgess, eds. (February 1993). Justice Without Violence (ebook). Lynne Rienner Publishers. p. 28. ISBN 1-55587-491-6. Retrieved 6 July 2006. ^ Douglas J. MacEachin. "US Intelligence and the Polish Crisis 1980–1981". ^ Gregory F. Domber (2008). Supporting the Revolution: America, Democracy, and the End of the Cold War in Poland, 1981—1989. ProQuest. p. 199. , revised as Domber 2014, p. 110 . ^ MacEachin, Douglas J. "US Intelligence and the Polish Crisis 1980–1981." CIA. June 28, 2008. ^ Repa, Jan (12 August 2005). "Analysis: Solidarity's legacy". BBC News. Retrieved 29 January 2017. ^ "Polish bishops for total ban on Sunday shopping". BBC. 23 August 2017. Retrieved 29 August 2017. ^ "Stores shut across Poland as Sunday shopping ban takes effect". ^ "Sunday trading ban comes into effect in Poland". 11 March 2018. ^ "Stores closed as Poland phases out Sunday shopping". ^ "Workers unite, east and west!". Workers' Liberty. Alliance for Workers' Liberty. 8 October 2009. Retrieved 29 January 2017. ^ McKinlay, John (8 September 1983). "Scargill angers unions with Solidarity attack". The Glasgow Herald. Retrieved 1 September 2014. ^ Gehrz, Chris (16 August 2016). "Could the U.S. Finally Get a Significant Christian Democratic Party?". Patheos. Retrieved 16 August 2016. The nominees of the American Solidarity Party (ASP), which takes its name from the Polish movement of the late Cold War and calls itself "the only active Christian Democratic party in the United States." Kenney, Patrick (2003). A Carnival of Revolution : Central Europe 1989. Princeton University Press. ISBN 0-691-11627-X. Kenney, Patrick (2006). The Burdens of Freedom. Zed Books Ltd. ISBN 1-84277-662-2. Kubik, Jan (1994). The Power of Symbols Against the Symbols of Power: The rise of Solidarity and the fall of state socialism in Poland. The Pennsylvania State University. ISBN 0-271-01084-3. Ledger, Robert. "From Solidarity to 'Shock Therapy'. British Foreign Policy Towards Poland Under the Thatcher Government, 1980–1990." Contemporary British History 30#1 (2016): 99-118. Matynia, Elzbieta (2009). Performative Democracy. Paradigm. ISBN 1594516561. Ost, David (2005). The Defeat of Solidarity: Anger and Politics in Postcommunist Europe (ebook). Cornell University Press. ISBN 0-8014-4318-0. Penn, Shana (2005). Solidarity's Secret : The Women Who Defeated Communism in Poland. University of Michigan Press. ISBN 0-472-11385-2. Perdue, William D. (1995). Paradox of Change: The Rise and Fall of Solidarity in the New Poland. Praeger/Greenwood. ISBN 0-275-95295-9. Staniszkis, Jadwiga (1984). Poland's Self-Limiting Revolution. Princeton University Press. Smolar, Aleksander, '"Self-limiting Revolution": Poland 1970–89', in Adam Roberts and Timothy Garton Ash (eds. ), Civil Resistance and Power Politics: The Experience of Non-violent Action from Gandhi to the Present, Oxford: Oxford University Press, 2009. ISBN 978-0-19-955201-6..
Wikimedia Commons has media related to Solidarność. Katherine Kenning collection of Joanna Wojciechowicz papers, MSS 8081 at L. Tom Perry Special Collections, Brigham Young University. Contains materials about Wojciechowicz's participation in the Solidarity movement. The Polish United Workers' Party was the Communist party which governed the Polish People's Republic from 1948 to 1989. Ideologically it was based on the theories of Marxism-Leninism. It also controlled the armed forces, the Polish People's Army. Andrzej Gwiazda is an engineer and prominent opposition leader, who participated in Polish March 1968 Events and December 1970 Events; one of the founders of Free Trade Unions, Member of the Presiding Committee of the Strike at Lenin Shipyard in Gdańsk in August 1980, Vice President of the Founding Committee of Solidarity, then Vice President of Solidarity in 1980 and 1981; in December 1981 interned and next imprisoned with six other Solidarność leaders. His wife, Joanna Duda-Gwiazda also was a prominent member of the anticommunist opposition in the 1970s and 1980s. Tadeusz Mazowiecki ( listen); was a Polish author, journalist, philanthropist and Christian-democratic politician, formerly one of the leaders of the Solidarity movement, and the first non-communist Polish prime minister since 1946. The history of Poland from 1945 to 1989 spans the period of Soviet dominance and communist rule imposed after the end of World War II over Poland, as reestablished within new borders. These years, while featuring general industrialization and urbanization and many improvements in the standard of living, were marred by social unrest, political strife and severe economic difficulties. Bogdan Michał Borusewicz, was the Marshal in the Polish Senate from 20 October 2005 to 11 November 2015. Borusewicz was a democratic opposition activist under the Communist regime, a member of the Polish parliament (Sejm) for three terms and first Senate Marshal to serve two terms in this office. He was the acting president of Poland for a few hours in 2010. Bogdan Jerzy Lis worked in Port of Gdańsk and Elmor company. Between 1971 and 1972 he was imprisoned for his participation in the anti-governmental coastal cities protests. Although in 1975 he joined the Polish United Workers Party, in 1978 he was one of the founders of the anti-government Free Trade Unions of the Coast. In mid-1980 he organized the strike in Elmor, and took part in the creation of the Inter-Enterprise Strike Committee and soon afterwards, together with Lech Wałęsa and others, of the NSZZ Solidarity itself. Anna Walentynowicz was a Polish free trade union activist and co-founder of Solidarity, the first non-communist trade union in the Eastern Bloc. Her firing from her job at the Lenin Shipyard in Gdańsk in August 1980 was the event that ignited the strike at the shipyard, set off a wave of strikes across Poland, and quickly paralyzed the Baltic coast. The Interfactory Strike Committee (MKS) based in the Gdańsk shipyard eventually transformed itself into Solidarity; by September, more than one million workers were on strike in support of the 21 demands of MKS, making it the largest strike ever. Independent Students’ Association is a Polish student society, created in October 1980, in the aftermath of the Gdańsk Agreement and the anti-government strike actions. It was a student arm, or suborganization, of Solidarity, and together with it, as well as other similar organizations, was banned after the martial law in Poland,. Some activists were arrested, others organized an underground NZS. 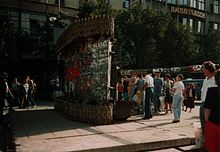 After the fall of communism in 1989, the organization was recreated, and its focus changed from political to cultural, although it still stands by its origins as seen by Polish students’ support for the Orange Revolution in Ukraine. It now is the largest independent student organization in Poland, with 90 chapters at Polish universities and a total of 20,000 members. The history of Solidarity, a Polish non-governmental trade union, began on August 14, 1980, at the Lenin Shipyards at its founding by Lech Wałęsa and others. In the early 1980s, it became the first independent labor union in a Soviet-bloc country. Solidarity gave rise to a broad, non-violent, anti-communist social movement that, at its height, claimed some 9.4 million members. It is considered to have contributed greatly to the fall of communism. Mieczysław Zygmunt Jagielski was a Polish politician and economist. During the times of the People's Republic of Poland he was the last leading politician from the former eastern regions of pre-Second World War Poland. Lech Wałęsa is a Polish retired politician and labour activist. He co-founded and headed Solidarity (Solidarność), the Soviet bloc's first independent trade union, won the Nobel Peace Prize in 1983, and served as President of Poland from 1990 to 1995.